This post was prepared by Storm Ambassador, Tim Cerami. 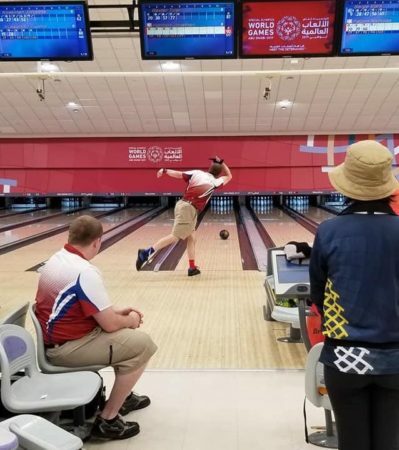 In August of 2017, we shared the story of Jon Harmon, a bowler from Boise, Idaho that was preparing to travel to Seattle to compete in the 2018 USA Special Olympic games. There, he won a silver medal in men’s singles using a Storm Son!Q donated to him by the Storm Brand Ambassador Team. In 2019, his story continues. Upon returning home from the Seattle games, Jon got more serious about his game, spending countless hours practicing and preparing for the Special Olympics World Games in Abu Dhabi. He traveled around the bowling centers in the Boise area looking to experience as many lane conditions as possible. On March 7, 2019, Jon started his journey to Abu Dhabi along with thousands of other Special Olympics athletes. His mission… bring a gold medal back to the USA and Idaho. Needless to say, Jon did “strike gold” while in Abu Dhabi. Bowling with his doubles partner Tyler Baxter, Jon rolled games of 224, 214, 189 with his SON!Q to help win the doubles competition by almost 150 pins. Jon returned to Idaho to a proud community of local bowlers. Congratulations to Jon and his partner for bringing home the gold. Thank you so much Storm for everything you do for me. You guys are the greatest Ever. Thank you for making fantastic products Of bowling balls & bowling equipment. But I want to say thank you too Storm Ambassadors. You guys make my journey possible Bye getting me the Storm SonicIQ bowling ball. Thank you for everything.